Gynecomastia is a medical term that refers to enlarged breast tissue in men. Though this oddly named condition is rarely talked about, it’s actually quite common. For men who feel self-conscious about their appearance, breast-reduction surgery can help. The procedure removes fat and/or glandular tissue from the breasts, and in extreme cases removes excess skin, resulting in a chest that is flatter, firmer, and better contoured. Causes of gynecomastia can be grouped into three basic types. Obesity can be a cause of “pseudo-gynecomastia”. This is not true gynecomastia since the breast gland is not the culprit of breast enlargement. Nonetheless, a growing number of men can undergo liposuction and improve the appearance of their chest. Secondly, there are a number of medications and medical conditions that can also cause gynecomastia. Dr. Maier will take note of your medical history and current medications and discuss pertinent issues during your consultation. Lastly, true gynecomastia, developing early in the teenage years, is a genetic condition and is due to increased activity of the breast gland. While estimates of this type of gynecomastia are as high as 65% in adolescent boys, most cases resolve by the age of 17 years old. Surgical correction of enlarged male breast tissue may be performed under general, or in some cases, under local anesthesia plus sedation. You’ll be awake, but very relaxed and insensitive to pain. More extensive correction may be performed under general anesthesia, which allows the patient to sleep through the entire operation. Dr. Maier will discuss which option is recommended for you, and why this is the option of choice. 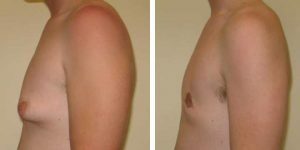 Gynecomastia surgery can enhance your appearance and self-confidence. The results of the procedure are significant and permanent. If your expectations are realistic, chances are good that you’ll be very satisfied with your new look. For more information regarding gynecomastia, click HERE.